The Thomas Marshall House, 409 N. Market Street in North Manchester, will be open December 10, 2016 from 1 to 4 p.m. The house will be decorated for Christmas as it might have been in 1854, when Thomas Marshall was born. The Marshall House is usually scheduled to be open to the public the first Saturday of the month. However, there are other numerous Christmas-related programs scheduled for the weekend of December 2-4. The NM Historical Society invites everyone to visit the Marshall House on a less-hectic weekend. Local artist and historian Steve Batzka and other docents will be available to guide people through the house and provide information about the Marshall Family. 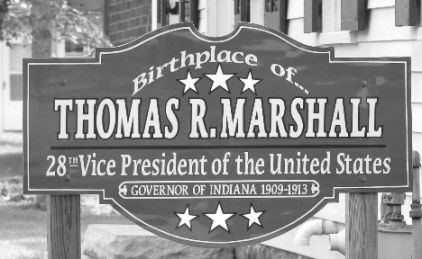 Thomas Marshall was born in North Manchester and became governor of Indiana and Vice President of the United States. His birth house, on north Market Street next to the library, was completely restored and furnished by the North Manchester Historical Society to its 1854 condition. It is open to the public on the first Saturday of each month, but will be open this December on the second Saturday. After December 12, the house will remain closed until next spring. 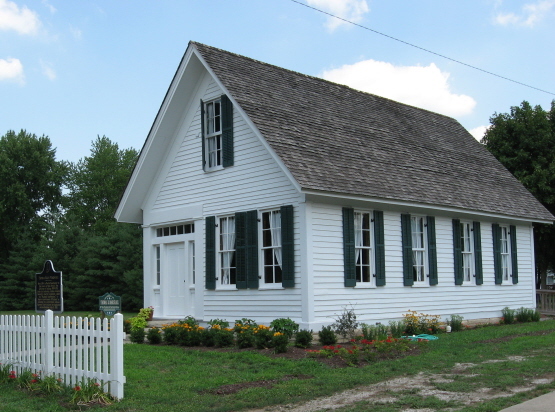 The Thomas Marshall birthplace house is once again open to the public on a regular basis. Stop by to visit on the first Saturday of each month, between the hours of 1:00 to 4:00 p.m. This living history museum is open from April 1st through December 7th. In 2012, the N. Manchester Historical Society completed a 17 year endeavor to restore this home to the 1850s era. Thomas Marshall was born here in 1854 to Dr. Daniel and Martha (Patterson) Marshall. The Daniel Marshall family moved to Illinois in 1856 and later to Missouri when Tom was still a youngster. In 1860, on the eve of the Civil War, the Marshall family returned once again to Indiana, settling in Pierceton and later in Columbia City. The Marshall home, originally built right on Main Street in the center of town, has been moved three times before reaching its current location just north of the Manchester Public Library on Market Street. The last move was documented on video, including a documentary of how the home was restored to its original look by a professional restorationist and many volunteers. A fee of $1.00 will be charged as admission and you will be guided through the home by knowledgeable staff who can tell you the stories of the time period when the Marshalls resided there. Special group tours may be arranged by calling the N. Manchester Center for History at 260-982-0672. This spring, the North Manchester Rotary decided to paint the Thomas Marshall House as its community project. It had not been painted in several years, and chipping and flaking were becoming more and more apparent. Rotary members and a group of Historical Society representatives met and decided that the logistics of using all-volunteer painters was just too complicated, as it would involve constructing scaffolding and taking it up and down over a period of several weeks while volunteers painted. The most cost effective and simple way to proceed was to do some volunteer work on the house, but hire a professional painter to do the painting. The total cost was a bit over what the Rotary had budgeted, but the job was accomplished with contributions from the Historical Society, a little extra from Rotary, and a great price from the painter, Historical Society Member Jim Mishler. It looks great! Some of the work was done by volunteers. Rotary arranged to have the house power washed. North Manchester Historical Society member Steven Batzka was in charge of scraping and painting the shutters, which are too delicate to withstand a power wash. Deb and Brad Bauneller from Rotary (and also Historical Society Members) put the shutters back up. We’re all set for many more years. Another Thomas Marshall House project will be taking shape this fall. America in Bloom plans to plant a garden of old-fashioned plants around the house, such as day lilies, peonies, and hydrangeas. An herb garden is also being considered. Watch for fall plantings and spring blossoms next April. Thank you to Rotary and America in Bloom for adopting the Thomas Marshall House and improving the property. The Historical Society plans to open the house with regular visiting hours in spring, 2012. Our main concerns now are additional furnishings, creating a small exhibit on Thomas Marshall for the house, and securing docents who can provide tours and information during open hours. Your help with any of these areas would be welcome! Call Nancy at 982-0672. The following work has been done on the Marshall house since 2007. The interior has been painted-all rooms are whitewashed as was appropriate in the era of the 1840's. The wood trim upstairs has been painted a soft dark green historic color. The staircase and all downstairs woodwork has been faux grained in oak pattern as was typical for this era. The upstairs floors are painted a dark brown and all floors downstairs have been faux grained in oak over the original ash floors that were in bad shape. An ingrain wool antique carpet has been installed in the parlor. Window treatments have been completed using a white muslin fabric in a simple style that was copied from the window treatment used at Shaker Village in Kentucky. The interior now waits to be furnished in a simple way with period antiques. We were able to secure a few needed pieces on loan from the Wabash County Historical Museum. The parlor needs to be wallpapered with historic reproduction wallpaper and perhaps some simple stenciling may be done in some of the other rooms. This summer the exterior needs to be power washed and scraped and repainted. The exterior shutters have been repainted and are remaining in good shape. The America In Bloom organization has future plans to install a period garden and fencing around the property. All Interior carpentry work is complete. This includes placing of register covers, hanging a door upstairs, placement of all the door hardware and placement of the floor quarter round in place. The process of faux graining of all the woodwork is continuing. Only one room, the office, remains to be completed. This is a five step process and is very labor intensive but the results are worth the effort. The upstairs woodwork and the kitchen woodwork is painted. The most difficult woodwork to finish was the staircase due to the many spindles. The antique ingrain carpet was put down on the floor of the parlor.The exterior shutters were repainted due to failure of the original paint. Touch up painting was done around several of the exterior doors. In August, during Fun Fest in North Manchester, we had a dedication of the new state marker that was placed in front of the house. A nice crowd attended and several officials from the state Historical Society attended. In late December three windows of old glass were broken out and these will need to be repaired when the weather is better. A supply of antique glass was ordered several years ago and is stored in the basement. In February, 1853 Daniel Marshall and his brother, Joseph, purchased lot 23 in North Manchester. In June of that year he was appointed Postmaster in North Manchester as part of political patronage under President Franklin Pierce. March 14, 1854 his son, Tom, was born in the house on lot 23, which was probably built soon after their arrival. Judging from a comparison of the value of the property when purchased and when sold, it appears that there was no house on it when the Marshalls bought the lot. When Tom's mother became ill and the decision was made to move west in search of health for her, Joseph purchased the half share and then his brother, Milburn, bought the property from Joseph in March of 1863. Sometime during his ownership, Milburn moved the house to the corner of Third and Market and sold it to George and Ellen Cowgill Rhodes who lived in the house until George's death in 1872. As part of the estate, the house was sold to John & Augusta Shively in 1872 and they lived there until they built a much larger house on the same lot in 1905. When the large house was finished, they sold the small (Marshall) house to Bartlet Krisher who moved it to a lot at the corner of Ninth & Walnut. After various owners there it became a rental property owned by Walter and Mary Jenet Penrod, who decided to sell it in 1992. The North Manchester Historical Society had money in hand, hoping that the house would eventually be for sale and bought it. They began restoration at that site and arranged to move the house in September, 1994 to a site on town property at the southern edge of Halderman Cemetery. There restoration continued; the random-width poplar floors were exposed, the stairway was reset at the original location, the woodwork was repaired and restored, and shutters were repaired and all surfaces inside and out were repainted. Materials suitable to the period were used for most of the restoration. The search for furnishings and other materials for the house is a long and difficult process. Slowly, as funds and suitable items are found, we are adding to the things in the house to show once more how the house might have looked in the last half of the 1800s. We are pleased to have this recognition of the significance of the Marshall House through the State Historical Marker. Dedication and Acceptance of the State Historical Marker for the Thomas Marshall Birthplace. Born 1854 in North Manchester in this house on Main Street. Was Governor of Indiana 1909 - 1913. 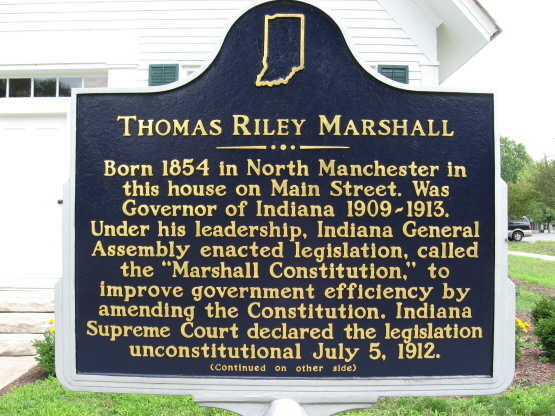 Under his leadership, Indiana General Assembly enacted legislation, called the "Marshall Constitution," to improve government efficiency by amending the Constitution. Indiana Supreme Court declared the legislation unconstitutional, July 5, 1912. He was elected vice president 1912 under Woodrow Wilson. Marshall generally supported Wilson's proposals. He refused to assume powers of presidency after Wilson's stroke in 1919, believing it would be unconstitutional. 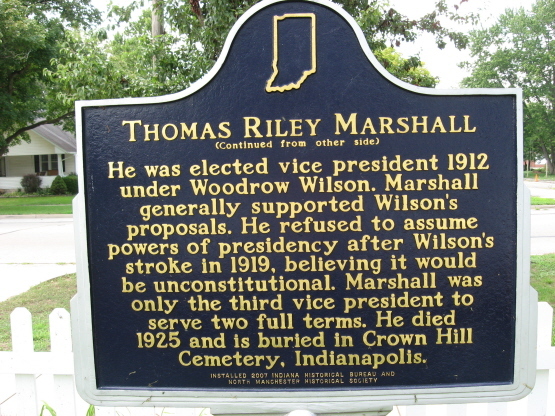 Marshall was only the third vice president to serve two full terms. He died 1925 and is buried in Crown Hill Cemetery, Indianapolis. The event was chaired by Darlene Bucher, who directed the work of the planning committee. Ferne Baldwin described the various moves of the house, David Bennett , author of a recent book titled, He Almost Changed the World: The Life and Times of Thomas Riley Marshall, spoke of Marshall's life. A community choir directed by Debbie Chinworth and accompanied by Diana Bucher delighted with a number of songs of the period . The Marker was presented by Pamela Bennett, Director, Indiana Historical Bureau, with appropriate remarks and accepted for the town by Carrie Mugford, City Clerk-Treasurer, and for the Historical Society by William Eberly, President. These three, plus Ferne Baldwin, uncovered the Marker . A sizeable crowd then read the Marker and toured the house which has been restored by the work of many volunteers under the skills and leadership of Steve Batzka, who completed much of the finishing work himself. A note from Ms Bennett later said, "The ceremony was a model for community participation, and a lot of fun. . . . Please convey my thanks and appreciation to everyone for the ceremony and the tour, as well as the preservation of the Marshall home and your history. I'm glad we were able to spend the additional time learning about your activities." For any of you who have been out of town for a very long time, my name is Marshall; Thomas Riley Marshall, and I was born in this very house on March 14, 1854. Do the math: I'm a certified Geezer! But I have also been a legal counselor to small communities, a Governor serving all Hoosiers, and the Vice President of all these 33 states ... yes, Kansas and Nebraska have just been admitted, though the news may not have reached this tiny town! You may already know that this birthplace home was located on Main Street in 1854, but I'll rely on someone much younger than I to tell the travel tales of The Marshall Home. When I was born in this little house, there was no Historical Society, much less a Public Library, Manchester College, Peabody Home, Timbercrest, or Fun Fest. My parents' idea of a Fun Fest was hearing a horse draw up in front of the house with a rider that was NOT about to deliver a baby! You do recall that my father, Daniel, was a doctor, don't you? Anyone looking out the front door of this simple frame house would have seen an unpaved street where dust choked the traveler in the dry days of summer, where hogs and dogs and the occasional mule were free to wallow after a rain. Do I understand that travelers today can choose among The Treeway, The Hospitality House, and the Fruitt Basket? My, how North Manchester has grown! We were a hardy population of 400 in 1854. If one looked down from a hot air balloon in those days, we'd see the cross-hatching of a few streets, a few thread-like roads winding among the trees; a few plumes of smoke; the gleam of sunlight on the river; we'd hear the distant thud of an ax; the sound of children shouting and laughing at play; a horse's whinny; a creaking cart; and all around this scene lies a vast forest, like an emerald ocean, stretching to the horizon. Here and there we'd see open spaces, like islands, that indicate the feeble beginnings of agriculture. My father, Daniel Marshall, told me that he had cut down walnut trees that were six feet in diameter at the stump and soared a hundred feet into the sky before there was a limb! Those mighty trees were logged and burned to gain ground for growing crops! My, how we have wasted the resources of nature! Well, it's nice to be back in North Manchester! From this gathering, I surmise that people here do recall that I got my humble beginnings here! I recall another visit, that time to Columbia City, to visit friends and family. I was vice president at the time and Mrs. Marshall and I came in on the night train. Unannounced. Unrecognized. As we were riding from the station to the hotel in the town hack, I thought I'd have a little fun with the driver. "I hear Thomas Marshall once lived in this town. Is that right?" I asked. "Yep," said the loquacious man, shifting his chaw of tobacco. "Isn't he vice president of the United States?" I continued. "Yep," replied the man, growing ever more eloquent. "Well, what do they say here in Columbia City about Vice President Thomas Marshall?" "They don't say nothing," the driver said. "They just laugh!" On that humbling note, and given my bland ambition toward high places, I will dispense with my political rise and address what I see as the needs of your times. Yes ... I know ... you are expecting me to say that, "What this country really needs is a good 5 cent cigar." However saddled with that offside commentary I remain, I would today suggest, "What this country really needs is lasting and loving homes." And so, we are gathered here today at this old home. This house became "home" to me in 1854. That was just 20 years after Richard Helvey became the first white settler to find the solace and promise of this place beside the meandering Eel River compelling enough to make it his home. Indeed, I have often speculated within the dusty reaches of my own mind, if this place has some cosmic connection to another home that became famous in 1854? That famous retreat and home belonged to Henry David Thoreau and sits beside Walden Pond. I suggest that one might draw more than a few parallels between the lessons of Walden and life beside the Eel. My father was a doctor, so this house dispensed care and healing even before I came along. After we moved on to Pierceton and ultimately Columbia City, this old home provided warmth and shelter to a succession of people in a succession of places! In my reading of the Holy Scriptures, I was always reminded that "As ye sow, so shall ye reap." Thus, it is entirely appropriate that this old home, having given care, comfort, and love for so many years, is now the recipient of this community's care and labors of love. It is good to see your efforts and your continued commitment to being a community of lasting and loving homes. It's been 19 years since I first returned to this town to participate in your sesquicentennial celebration in the play "Memory Speaks." As I did on that stage, I ask you to remember, "Friendship and goodwill. Friendship and goodwill." With the dedication of the Thomas Marshall Birth-House on August 12, 2005 we have marked the completion of the first phase of this significant project. We have rescued the house, moved it to a secure location, and restored the basic structure to its original form. We have recovered its "architectural integrity". This has been a long and time-consuming process. It was exciting to have Thomas Marshall himself (a.k.a. David Grandstaff) bring some remarks at this dedication ceremony. President Ferne Baldwin gave a history of the house itself. There was special music by Terry McKee, Marilyn Mason, and Debra Lynn. The Rotary Gazebo provided a beautiful setting for the program. Special guests included Mr. Stephen Berrey from the Indiana Historical Bureau and Mr. John Harris of the Indiana Historical Society, both from Indianapolis. The second phase will involve the final refinishing of the interior in a somewhat original form. This involves painting, finishing the floor and woodwork and installing floor coverings. The third phase is the furnishing of the house and creating displays of Marshall history. Since we have no original furniture from this house from the time of the Marshalls, we need to acquire various pieces from that general time frame. I am suggesting the period from 1850 to 1900. If we want to include the time span of Mr. Marshall's life, we would extend this to about 1925. It will be doubly significant if furniture and other household articles have a North Manchester connection. We already have a cast iron stove made in North Manchester. We also have a dresser that was purchased by Amos B. Miller of rural North Manchester for his daughter, Bertha, on her 18th birthday, February 8, 1891. The Manchester merchant who sold the dresser was J. Straw, whose store was located in the building now occupied by John Knarr's book store. The shipping tag is still attached to the back of the dresser. A penciled notation in one of the drawers indicated the price at $10.00. There is also a small collection of doctor's supplies, including medicine bottles and a satchel carried by an early physician on his home visits. A committee has been working for some years on identifying items for the house. Our staff at the Center for History can develop exhibits and photographs for display. Riley Marshall grew up in Virginia, in what is now West Virginia. In 1818 he and his family came to the newly admitted state of Indiana and settled in Randolph County. Then they moved to Grant county and later sold his land there and moved to Wabash County. In the fall of 1848 he purchased 142 acres of farmland west of Lagro and soon original plat 108 in Lagro. In the late 1850s Riley moved to Kansas near his married daughters. Daniel Marshall, one of Riley's nine children, became a physician. He married Martha Patterson who had come to visit her sister in Marion, Indiana and met him there. They located in North Manchester in 1848 and Daniel established a medical practice. They lived in a house on Original Plat 24 on Main Street which the Thorne family had purchased from Peter Ogan in 1839. The Thornes probably built the house sometime between 1839 and 1848. Thomas Riley Marshall was born in North Manchester in this house March 14, 1854. When he was two years old, his mother developed tuberculosis. Daniel determined to treat her with what was called the open-air treatment and they moved westward near Urbana, Illinois where Martha was put on a diet of raw eggs and milk. Her health did not improve so they moved to Kansas near others of the family. Kansas was in a turmoil with the struggle between pro-slavery and free state settlers. The Marshalls soon moved to La Grange, Missouri and there Martha regained her health. But Dr. Marshall had become involved in the political controversy and his life was being threatened. They fled at once: by sundown the family was on a boat headed for Quincy, Illinois. By November Dr. Marshall was practicing medicine in Pierceton, Indiana. The Marshall House was moved about 1870 to the northwest corner of Third and Market Streets, probably by M. S. Marshall who owned the house from 1866-1872. His relationship, if any, to Daniel Marshall is unknown, but during the restoration of the building a business card for M. Marshall was found in the wall. George and Ellen Cowgill Rhodes were owners and occupants after the house was relocated to Third and Market. After George Rhodes died the property was sold to John and Augusta Shively. In 1905 they completed the building of a residence on the property and sold the building to Bartlet Krisher. Bartlet moved it to the northwest corner of Ninth and Walnut. The history of the house during its life on Ninth and Walnut has not been documented. By 1992 it was a rental property owned by Walter and Mary Jenet Penrod. That year it was acquired by The North Manchester Historical Society and the restoration began. Additions to the house were removed there, a new roof was put on and the house was prepared for another move. On September 30, 1994 the house moved slowly a block west to Market and down Market to a site at the south end of Halderman park where a basement had been prepared. There the restoration continued. The Thomas Marshall House, now located on North Market next to the Public Library has traveled a long journey from its original home on Main Street at the site of the History Center. When the Historical Society became owners of the building it was located at Ninth and Walnut on the northwest of that intersection. What followed was the long process of finding another site, preparing the site and planning the move. Eventually the day came, and with lots of school children and other lining the streets, the house moved slowly down Market to its new and final home north of the Library. Since the time, for more years than we hoped, we have worked within the limits of funds and time and energy to restore the house to the period of the 1850s when it was built. Before it was moved we replaced the roof and tore of a shed-like addition which had been built on the rear. Since we have rebuilt the rear wall (where the shed had been removed) replaced the stairway to its original position, replaced and restored windows, painted the exterior, took out added floors, wired the house, dry walled all walls. This summer we have been working to bring the renovation to completion. Shutters are restored and painted. The exterior and the interior have been painted the final coat. Authentic hardware for new doors and for the shutters has been secured through the hard work of Steve Batzka. One of the most difficult tasks has been the restoration of the interior woodwork. It had been modified and cut up through the years. By the close of this season we hope to have the restoration complete and be working on the furnishing of the house with period furniture. That, too, is a difficult task. Removal of front half of the first layer of flooring boards revealed the original floor boards had been painted which, in turn, outlined the position of the original wall locations and stairway location. Removed and replaced in the original location, the stairway to the second floor. The railing spindle's original location were discovered by locating the holes in the original floor boards and were replaced accordingly. Both railing and spindles in some locations had to be reproduced to match existing. New walls have been framed in their original locations in the Entry and Living Room. The exterior wood siding for the most part has been completed and some of the windows have been restored. New wood siding that was installed last summer was prime painted this fall. There is low heat in the building and it will be maintained as necessary. In the back half of the house the rest of the newer floor boards must to removed. It is hoped that this will reveal the rest of the original wall locations. Portions of the second floor must be replaced and/or renewed where the stairway was taken out and framing must be stabilized. Front door assembly and side lights installed and restored. All plaster walls and ceilings except for observation areas to be removed. All floors sanded and refinished, stairway stripped and refinished, and wall paneling, wainscoting and trim stripped and refinished. Painting inside and outside completed. We thank Joe Kitchel for his restoration work and Steve Batska for helpful consultation. The Boy Scouts and Robert Pittman deserve special thanks for their scraping and painting and Mr. Taylor for the use of his woodworking shop and tools in recreating and matching existing stairway parts and other wood trim. This has saved the Historical Society hundreds of dollars in millwork costs. The Thomas Marshall house was purchased with Historical Society funds which had been held for several years for that purpose. The total project of moving the house to a permanent site, renovating it, restoring it to the period of the 1850's securing funds to endow the operation as an educational center and museum is now underway. The Community Foundation is playing a major role through the assistance of the Lilly Endowment. This Endowment fund will match one dollar for every two contributed to the Community Foundation for the Marshall project up to $12,000. Lilly Endowment has already contributed $10,000 to enable the town to purchase the Tyner house which will be moved and eventually sold for endowment funds. 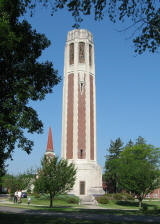 While at Wabash College, Thomas Marshall became a member of the Phi Gamma Delta Fraternity. While vice-president, he noted that this fraternity was one of the major contributing influences in his life. When a member of this fraternity at Wabash College learned about the project the Historical Society was starting with the Marshall house through an article in the New-Journal, support for the project by this fraternity was undertaken in several ways. First, they have provided direct hands-on labor-- a major and encouraging contribution. Second, they have started a fund raising effort to support the project with dollars and have worked to enlist the national fraternity organization to assist in that effort. The end result of this campaign will be to provide a legacy for future generations to learn about North Manchester's favorite son, who became Indiana's governor and then vice-president for two terms. The house, as a museum, will also provide an ideal place to learn about the 1850-1900 time period in U. S. history. 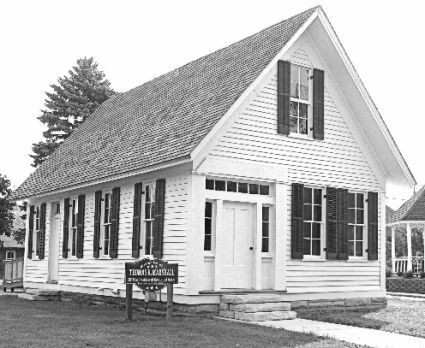 To be able to renovate and restore, to provide an endowment for maintenance and funds to purchase period pieces as they become available, and to provide free admission to school children, the Historical Society is launching the Thomas Riley Marshall Commemoration Campaign. We believe this is a worthy project for your contribution. It will benefit the town by adding an important attraction to Market Street which is currently part of the focus of the trees project and which already includes the swimming pool and the sports complex. It will benefit the children of many coming generations by providing a setting for a better understanding of their history. It will provide a unique commemoration of an important historical figure who was born in our town. How much are you expected to give? Only you know your financial capabilities. We hope that with all of us-members and non-members, town supporters, and members of the Phi Gamma Delta fraternity family-we can reach the goal of $120,000. We want to do an authentic and professional job that will make us all proud, and that will cost money. We also want to have enough endowment that the house can be well maintained without constant worry. The house is currently being restored to its former configuration by the removal of "fake" siding, porches, a dormer and modern bath and kitchen appliances. If you are close enough, drive by and note the progress. A new old-fashioned shingle roof may be the next special project. Some utilities have promised free wire removal as we prepare to move the houses- another major contribution. There are many details. Several members of your historical society have and are giving major amounts of time and work to the project. Your money contributions are and will be essential to our success. Proper recognition of donors will be made at the restored home. Special consideration will be given to gifts of larger amounts. Multi-year pledges can also be given. All contributions should be sent to the Community Foundation. September 30, 1994 was the big day. Once more the birthplace of Thomas Marshall was loosened from its moorings and for the third and, we hope, final time it was maneuvered down the street to its new niche on Market Street. Ninth Street between Walnut and Market was closed in the early morning. Market was closed as the school-bus morning runs were finished. The utility companies were most cooperative as they took down lines and then replaced them after the house passed through. The entire process of moving the house five blocks required about two and a half hours. Many school children and adults lined the streets to watch. The new location is just off the southern end of Halderman Cemetery/Halderman Park on property owned by the town. Nearby the standpipe casts its shadow on the house and soon the new town library will be a newcomer amid these historic structures. Since Market Street is increasingly one of the town's main thoroughfares it is an appropriate location for the birthplace of a former Indiana Governor and a two term Vice President of the United States under President Wilson. The Tyner house, formerly located at this site, has been moved to a location in the 800 block of North Walnut and may soon be listed for sale. The lot where the Marshall House recently stood may also be listed for sale. Both properties will provide funds for an endowment for the maintenance of the Marshall House. Restoration of the Marshall house is underway. Now, for the first time, there is a basement under the house. It will be used for storage and for utility needs. A dormer and other recent additions have been removed. The new shingle roof draws the eyes and lends an air of nostalgia. Further restoration and interior work will progress slowly. If anyone has suggestions of authentic furnishings from the 1850's the committee is eager to have information about them.